Customers walk past a Great Wall Fengjun 6 for sale at a dealership on the outskirts of Beijing. BEIJING — Grey Liu bought his third vehicle four months ago — a Foton pickup, lured by its $7,000 price tag and its ability to transport his motorcycle to the grasslands of northern China where he likes to ride. 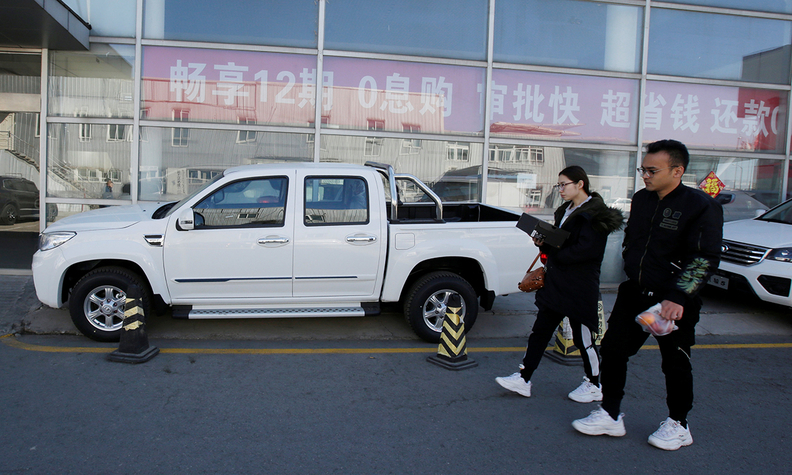 The Beijing businessman is among a growing number of drivers in China keen on pickups — either for leisure or just because they like them — expanding the market beyond traditional demand for farm, construction and maintenance work. Pickup demand — both work-related and the newer interest from mainstream consumers — has climbed on the back of an easing in government restrictions and last year China became the world's second-biggest pickup market. Signs this year that rules may be relaxed further are prompting industry executives and analysts to talk of a potential doubling or even greater jump in demand. That in turn is spurring Great Wall Motor Co., China's largest pickup manufacturer, and Ford Motor Co., the maker of the most popular U.S. pickup, the F series, to bolster product lines. "We believe demand for multipurpose pickup trucks will soon start taking off in a major way," she said in a written statement, declining to provide further details. Although overall demand in the world's biggest auto market fell last year for the first time since the 1990s, pickup truck sales rose 10 percent to around 452,000 vehicles for a fourth straight year of growth, according to LMC Automotive. That helped China overtake Canada as a pickup truck market, although it is far behind U.S. figures of just under 3 million. Like much of the world, the segment remains a niche in China, accounting for less than 2 percent of overall sales. That contrasts with 16 percent for the United States and over 40 percent for Thailand. Then in January, China's state planning body said it would steadily relax restrictions on pickups in cities — part of measures aimed at lifting consumer spending. It did not, however, say when or where rules might be eased. Great Wall's new leisure pickup would be similar to Ford's midsize Ranger and priced at more than 200,000 yuan ($29,800), a mark up of at least 70 percent over its current most expensive pickup, sources familiar with the plan said. According to a separate source, the vehicle is part of the company's plan to eventually enter the United States, although the model would likely have to be modified. Great Wall had aimed to enter the U.S. market in 2021 but U.S.-China trade tensions have currently made exports from China uneconomical. Ford plans to launch a new pickup in China this year, adding to the F-150 Raptor which it introduced in early 2017 and the Ranger which was launched in 2018. Sales for the Raptor, priced from 466,800 yuan ($69,565), tripled to nearly 2,500 vehicles last year, the company said. It declined to disclose sales for the Ranger which sells from 305,800 yuan ($45,570). Zhejiang Geely Holding Group Co. is developing a new electric pickup, a company source told Reuters, adding it would be made by its Yuan Cheng Auto unit. The source, who declined to be named as the plans are not public, did not provide further details. Li Jiyuan, who works at a dealership that sells Toyota Motor Corp. and Ram pickups, says business has been hit somewhat by trade war uncertainties. To drum up more traffic, the dealership will expand into sales of BMW crossovers and explore online sales, he added.